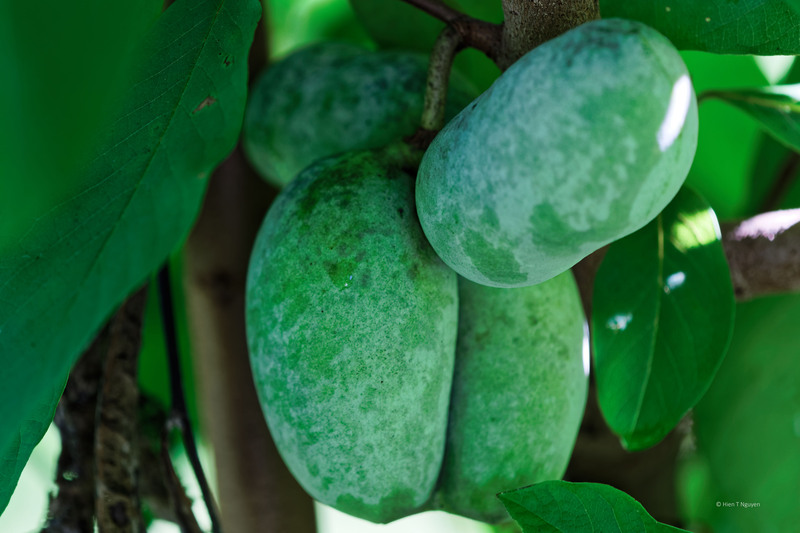 Pawpaw (Asimina Triloba) is a fruit tree native to the Northeast of the United States. I have been growing several of them for five or more years. At first, the deer tried to destroy them by chewing on their bark and branches. However, the trees kept growing bigger and bigger, and this year two of them are finally bearing about a dozen fruit. They are still ripening so I can’t tell how good they are yet, but they are said to taste like custard apple and cherimoya. So far the deer have spared the fruit. 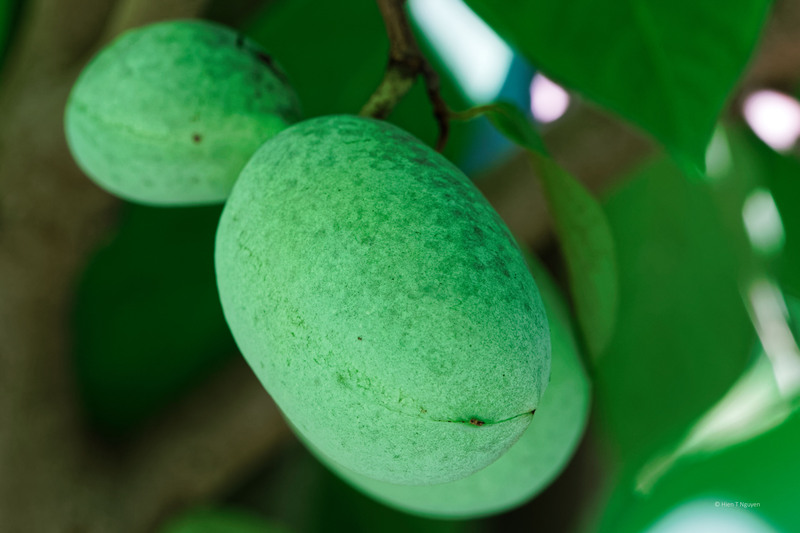 It’s nice to see these – thought they’re northeast natives, I didn’t see them often and really am not familiar with the pawpaw. Your photos bring out the coolness, the roundness – nice. Hi Chu Hien!! These are going to awesome!!! And I thought I had some pretty good stuff down here! I am hoping I will get them in time, right after they reach their optimum ripening, and before the animals get them. Good luck! I had to bag each off my guavas individually in order to avoid wishing in them!!! And it worked!! Have fewer but that might be the result of the bagging, but that’s okay as I was able to enjoy them this year!! I’ve never tried one, but they look and sound tasty. I do know that deer love them when they are ripe, so you’d better keep an eye on them. Oh, no! Not when they are ripe! I’ll watch hem like a hawk! Yay!!! Glad they survived the deer. So far, so good, Katelon! Good afternoon, Hien. I have never heard of this fruit. I am curious and wonder if we could find it in the store. I’ll pay attention next time when I am there. I was googling fruit tree recently, and it seems like pear tree will do well here 😉 Still thinking… Ha. Helen, I have not seen them in stores. They are the kind of fruit that cannot be easily transported long distance. 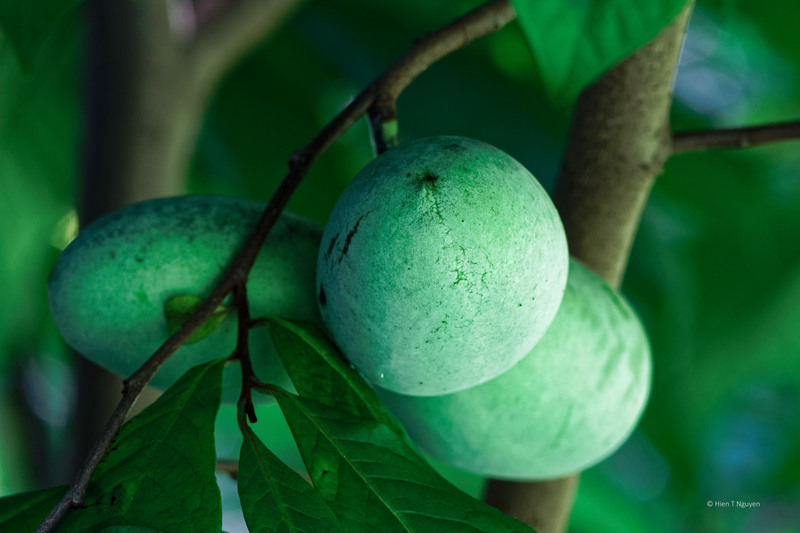 They have to ripen on the trees, and when ripe they may be too soft to transport. Pear trees grow well in cold climates, so maybe you can grow them in your area. However, ask around to be sure. Thanks, Hien. Would you please take another photo when they are ready to eat? I read that they will turn brown? And from the article I read, they taste like banana. Very interesting. Thank you, Hien. I am looking forward to seeing it.